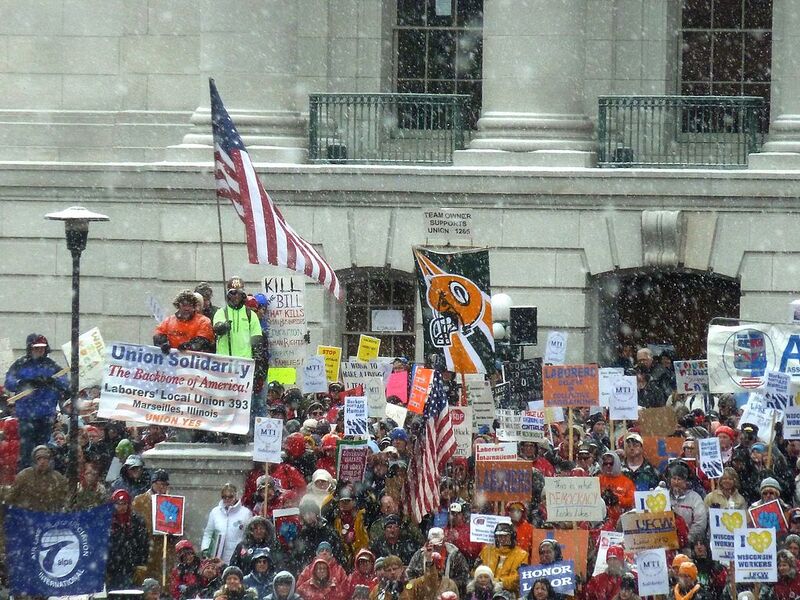 Thousands gather outside the Wisconsin state capitol building during the 2011 Wisconsin budget protests. Justin Ormont / Wikimedia. Amid some mixed and intermittently disappointing results earlier this month, the defeat of Scott Walker was an unambiguous moment of catharsis. Acting proudly as tribune for the national conservative movement and its billionaire backers, the two-term Wisconsin Governor spent eight years waging ceaseless war on the state’s public education system, its environmental laws, its social safety net, and, critically, its labor movement. Despite fierce and often heroic resistance from unionized workers, activists, and citizens, Walker leaves office with a catastrophic legacy to his name, having successfully implemented many of the Republican Party’s most toxic planks in the face of strong headwinds. Following a protracted battle in 2011, which resulted in a weeks’-long occupation of the Capitol Building, collective bargaining rights were stripped from most public employees. After a concerted and nearly successful effort to recall him failed, Walker won reelection in 2014 and continued the assault: tax cuts, a voter ID law designed to suppress turnout, draconian welfare rules, the expansion of school vouchers, abortion restrictions, and relaxed gun control laws all followed. Notably, in 2015 Wisconsin became the twenty-fifth state with a repressive “right-to-work” law on the books, consolidating Walker’s reactionary crusade and dealing a further body blow to organized labor. The following year, Hillary Clinton would become the first Democratic presidential candidate to lose Wisconsin since the Reagan landslide of 1984, as Donald Trump narrowly captured the state and its ten electoral votes. The Republican conquest of a progressive bastion, it seemed, was complete. Dan Kaufman’s The Fall of Wisconsin chronicles this eight-year Republican onslaught and the various efforts to resist it from within, weaving history with interviews and testimony from key figures such as Randy Bryce, the ironworker who this month ran a strong second in the race for Paul Ryan’s recently-vacated House seat; Lori Compas, a local activist who in 2012 challenged Republican state senator Scott Fitzgerald; and Mike Wiggins Jr., an Ojibwe community leader. Though Kaufman is a native of the state, his choice of subject is neither arbitrary nor merely personal. As he details, its history is a radical, populist one punctuated by struggles that often resulted in major progressive victories with national implications (America’s first workers’ compensation program and a progressive income tax, to name but two). Briefly a beachhead of the Socialist Party, Wisconsin elected the first socialist mayor in the US (Milwaukee’s Emil Seidel) and was the only state won by Robert La Follette in his insurgent campaign of 1924. Its significance as a target of Republican belligerence should therefore not be understated. Indeed, as Kaufman shows, the state became a key battleground during the Tea Party ascendancy and a veritable laboratory for the power of big donors and unrestricted dark money following the Supreme Court’s disastrous Citizens United decision. Using their astroturfed American For Prosperity advocacy fund, Charles and David Koch spent tens of millions on the 2010 elections — the latter making a personal donation of $1 million to the Republican Governors Association. Even more money was poured into subsequent elections, with Walker out-fundraising his Democratic opponent in the 2012 recall contest by a whopping $30 million to $4 million. Wisconsin’s story is therefore an alarming illustration of the Republican Party’s long-term strategy at work and what its vast political and financial infrastructure is ultimately capable of even in the face of strong opposition. Its goal, as Kaufman’s book makes clear, is not just the passage of specific pieces of conservative legislation and laws that favor corporate interests, but the destruction of all obstacles to permanent Republican control of the legislative process and the reconfiguring of politics with the aim of consolidating those interests in perpetuity. As with the restrictive voter ID laws pushed by Republicans across the country, which disproportionately target working class voters of color, Walker’s attack on Wisconsin’s unionized workers was thus anything but incidental. Indeed, as the resistance it inspired so clearly demonstrates, the labor movement and the ethos of community and solidarity it still represents – despite being in a position of relative weakness — remains one of the major popular impediments to a complete corporate takeover of America. Since the beginning of Walker’s assault on Wisconsin’s labor movement, union density in the state has reportedly fallen by nearly forty percent. If Kaufman’s book is an account of a lethal Republican offensive against a progressive bastion, it is also, indirectly, a chronicle of Democratic complacency in the face of the onslaught. While Walker enjoyed the logistical and financial backing of national Republicans, his adversaries were mostly left to fend for themselves by a DNC that either failed to grasp the strategic importance of Wisconsin or just didn’t particularly care what happened to the teachers, firefighters, trade unionists, and students who made up its base there. One month before 2012’s recall election, as polls suggested Walker’s Democratic challenger Tom Barrett held a slight lead, the state’s electorate was bombarded with ads linked to the Koch brothers. Apart from a single tweet on election night, neither President Obama nor any national Democrats came to the aid of Barrett’s campaign. Such complacency, even from centrist Democrats, initially appears difficult to explain given Wisconsin’s electoral history and strategic importance. Traditionally considered a blue state, no Democrat since 1960 has secured the presidency without first winning its primary. But following a decisive loss to Bernie Sanders in the 2016 contest, Hillary Clinton became the first presidential candidate of either party since Richard Nixon in 1972 to skip the state altogether (not visiting until November of 2017 to promote a book about her loss). At least on a national level, liberal pundits seemed to take it for granted. As MSNBC’s Rachel Maddow put it a few months before the 2016 presidential election: “The Republican Party really, really, really wants Wisconsin to be a swing state — not true…I mean, even Michael Dukakis won Wisconsin, right?” Such thinking would ultimately cost the Democrats Michigan as well. What the case of Wisconsin — from Walker’s onslaught to Clinton’s surprise 2016 loss — ultimately illustrates are the consequences of the Democratic Party’s decades’ long transformation and the poverty of strategic thinking that has accompanied it. Increasingly a party catering to the affluent and white collar professionals, its generalized pivot away from redistributive politics, unions, or egalitarian policies around trade (and towards a rhetoric of bootstraps individualism and fiscal conservatism) has produced an incoherent voter coalition that can no longer be depended upon to deliver it big legislative majorities or electoral college victories. All the while, traditional sections of its base in working class communities across the Midwest have withered along with the relative prosperity they once enjoyed and the institutions that sustained them. It bears mentioning that, even amid Walker’s recent and long-overdue defeat, Democratic numbers among poorer and union households actually fell and were bolstered by college graduates. As Kaufman observes, it was Walker’s Democratic predecessor Jim Doyle who helped lay the ideological groundwork for Act 10, promising in 2002 to cut 10,000 public sector workers and boasting in December 2010 that he’d made deeper cuts to state employees than any other governor in Wisconsin’s history. Despite some pro-labor rhetoric in 2008, Obama, meanwhile, failed to aggressively push the card-check labor law bill he’d campaigned on and it landed dead on arrival in a majority Democratic Senate. Republicans, meanwhile, have assiduously chipped away at their opponents’ base and infrastructure, obtaining deadly legislative power despite boasting just a single popular vote presidential victory since 1988.